Since the introduction of the healing modality Chakra-puncture in 2003, there have been an estimated 500,000 individual sessions officially completed. This does not include teaching sessions, training hours and sessions that individuals may share with their family members which would approximately be another 100,000 individual sessions. These Chakra-puncture sessions have been available in Australia and UK/Europe where there are now 49 (AU) and 15 (UK/EU) fully accredited and insured Chakra-puncture practitioners. There are also over 60 practitioners officially in training in Australia (31 in total) and UK / Europe (30 in total) and many students who have completed the course and are insured under the head trainers insurance to use at a domestic level with friends and family. Further our clinics have completed a small pilot study showing that Chakra-puncture results in 'none to minimal' physical pain or reaction in the body, this is in contrast to acupuncture or dry needling, where acupuncture sessions have documented side effects or physical reactions, for example slight haemorrhage (2.9% rate of occurrence), hematomas (2.2% rate of occurrence), dizziness (1% rate of occurrence) or other systemic symptoms (2.7% rate of occurrence) (Ernst et al, 2003). Other side effects of acupuncture mentioned, that were all below a 1% rate of occurrence, but still present were fainting, nausea, prolonged DeQi (paraesthesia) and increase in pain. In one case, aphasia (inability or impaired ability to understand or produce speech) was reported lasting 1 h after acupuncture (Ernst et al, 2003). Chakra-puncture has no such reported effects. A total of 30 Chakra-puncture sessions were investigated with 29 subjects (1 of whom received 2 sessions) who all signed an informed consent form and agreement to describe their physical responses to a 40-50 minute Chakra-Puncture session. All participants had been clients of regular Chakra-puncture sessions for between 1 and 5 years. At the end of one Chakra-puncture session each client was asked to rate their experience of the four physical reactions on a scale of 1 to 6; 1 being did not occur, 2 being very minor, 3 being minor, 4 being moderate, 5 being severe and 6 being very severe. The physical reactions rated for either during or immediately after the Chakra-puncture needles were inserted were: Bruising, Bleeding, Numbing and Nerve Sensation. Muscle spasm and muscle ache were also rated on a 10 point pain scale, where 1 was no pain and 10 was extreme or maximum pain. 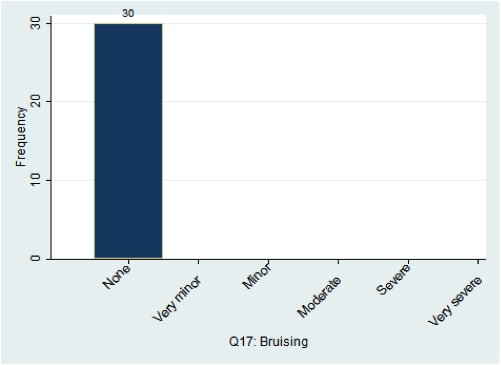 As seen in Figure 1 the percentage of participants who experienced any of the four physical reactions rated on a scale of 1 to 6 were; Bruising 0%, Very minor bleeding (one drop) 3% (1 person), Numbing 0% and Nerve sensation 3% (1 person). Figure 1. Frequency of occurrence of four physical symptoms during 30 individual Chakra-puncture sessions. Physical symptoms include, bruising, numbing, very light bleeding and nerve sensation which are all common ('normal') symptoms after needling therapies. Only four other additional symptoms were also reported, from a possible 20 other additional symptoms. they were “dehydrated before session”. after or during the session, no additional details were given. · Three people (10%) experienced 2/10 or 3/10 muscle spasm. sessions or if it had been addressed in session. These results indicate that Chakra-Puncture is a safe modality that has none to no significant and only transient side effects. These side effects are comparable to other forms of needling. Additional research with a larger number of participants is needed to provide a more accurate comparison with other needling modalities.